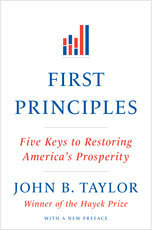 It’s good news that economic issues are now getting more attention in the presidential campaign. More than 400 economists have signed a statement on the differences between the Romney economic program and the Obama program—the numbers are growing each day—and economic commentators including on CNBC and the Wall Street Journal (here and here) are discussing it. Judging by the hits on this post on Economics One, there’s a great deal of interest in the issues rasied in the economic white paper—authored by Kevin Hassett, Glenn Hubbard, Greg Mankiw and me—comparing the effects on economic growth of the Romney program and the Obama program. Of course, the selection of Paul Ryan has set off a huge number of articles on economics from budget policy to monetary policy. It’s already clear to most voters that the presidential candidates have vastly different approaches to economic policy. But many people are still not informed about the implications of these two approaches. In my view the more voters get informed, and the more their votes are based on that information, the more likely the officials they elect will be able to revive the economy. But this will not happen if the political campaign drifts back away from substance as campaigns so often do. 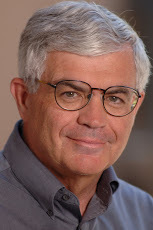 Keeping the debate focused on economics requires that economists participate and not merely sit back and watch. 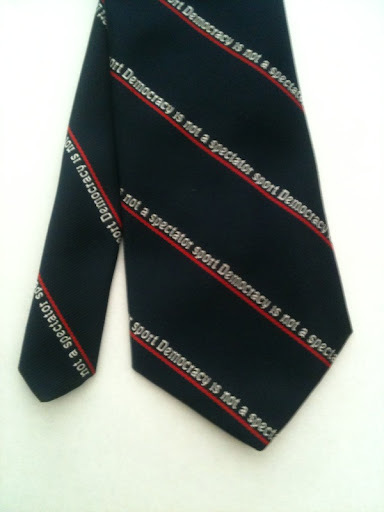 To remind myself of this, I like to wear this “Democracy is not a spectator sport” tie a lot during the election season.